March 21, 2016 – The team behind NASA’s New Horizons mission – which last summer delivered the first close-up look at distant Pluto while capping the initial reconnaissance of our planetary system – earned several honors this month for its historic accomplishments. 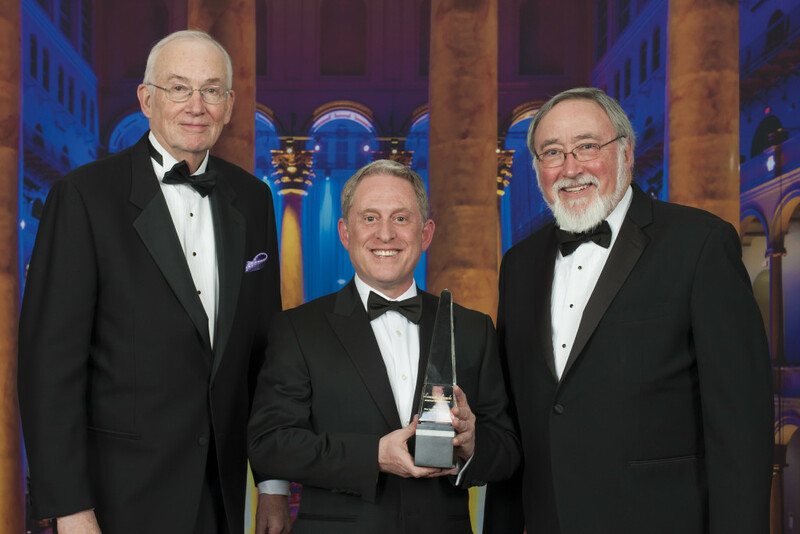 On March 4, the team – jointly based at the Johns Hopkins University Applied Physics Laboratory in Laurel, Maryland, and Southwest Research Institute in Boulder, Colorado – was honored by Aviation Week and Space Technology magazine with its 2016 Laureate Award for space exploration. On March 9-10, the American Astronomical Society presented the team with its Neil Armstrong Space Flight Achievement Award, and New Horizons Principal Investigator Alan Stern with its Carl Sagan Memorial Award. Then on March 11, on behalf of the mission team, Stern also accepted the Dr. Robert H. Goddard Memorial Trophy from the National Space Club. In July 2015, after 3-billion mile, nine-and-a-half-year voyage, the New Horizons spacecraft completed its flight through the Pluto system and began a yearlong relay of recorded images and other measurements, revealing spectacular, bizarre worlds of geological wonders – such as water-ice mountains floating in Pluto’s sea of frozen nitrogen. “These awards are a tribute to the incredible, tireless scientific and engineering work of the entire New Horizons team – from all around the United States – over the past 15 years, culminating in the Pluto flyby last July that captured the imagination of the world,” said APL’s Glen Fountain, who served as New Horizons project manager from launch preparations through the Pluto encounter. APL designed, built and operates the New Horizons spacecraft and manages the mission for NASA’s Science Mission Directorate. SwRI, home institution of Principal Investigator Stern, leads the mission, science team, payload operations and encounter science planning. New Horizons is part of NASA’s New Frontiers Program, managed by the agency’s Marshall Space Flight Center in Huntsville, Alabama.